Soft and chewy chocolate chip shortbread bars made more decadent by a chocolate topping. Instant coffee adds another layer of flavor. 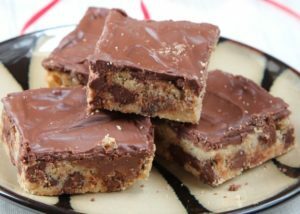 A perfect ending to a special meal, these Mocha-Chocolate Shortbread Bars are very easy to prepare using ingredients that are readily available from your pantry. Combine the flour, sugar and coffee granules in a medium bowl; add butter and vanilla, and beat at low speed with an electric mixer until blended. Fold in 1 cup chocolate morsels. Press dough into an ungreased 9-inch square pan; prick dough with a fork. Bake at 325° for 20 minutes or until lightly browned. Sprinkle remaining 1 cup chocolate morsels evenly on top of warm shortbread; spread the melted chocolate to form an even layer of chocolate frosting. While still in pan, cut shortbread into bars and set aside to cool for 30 minutes before removing. Serve these Mocha-Chocolate Shortbread Bars with ice cream, if desired.